Kiwitub and NZ fencing considerations. Three children drowned in spa pools in New Zealand from 1999 to 2005. They were under four years old. NEVER leave small children unsupervised around water. Do I need a fence around Kiwitub? We think that if there’s one thing that by virtue of its design and construction shouldn’t require a fence, it’s the Kiwitub. Details follow. If you want a definitive answer before purchasing, print out these pages [or click here to download as a PDF(1 megabyte - may take a few minutes)] and take them to your local building inspector or Council. Also take along one of our brochures, or pages off this website, to show them what Kiwitub is, as we put the invention on the market only in 2005 and it’s still new to many people. In 1987 New Zealand passed the Fencing of Swimming Pools Act, requiring fencing at least 1.2m (4ft.) high around residential spa and swimming pools and automatically-closing gates with self-locking latches. The Act applied to any residential pool with a water depth of more than 400mm (16in. ), and was adopted by Councils throughtout the country. The Act also gives those Councils the right to grant an exemption in specific cases. 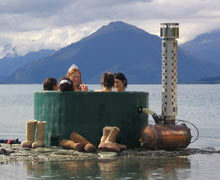 Kiwitub, which is not a spa pool or spa pool system, did not exist when the Act was being drafted. Also not considered were the deep blow-up paddling pools now commonly sold by shops like The Warehouse which technically, by the Act, also require fencing. The body charged with child safety in pools is Water Safety New Zealand. In 2004, its then head, Alan Muir, stated on National Radio that most of the deep paddling pool owners were not going to fence their pools, and that he thought the Act should be revisited to take into account new products on the market since its introduction in 1987. A new New Zealand Standard (NZS 8500:2006 ‘Safety Barriers and Fences Around Swimming Pools, Spas and Hot Tubs’) was published in early 2007. This is to be the basis for a new Act in 2007. No-one wants little kiddies to drown. NEVER leave small children unsupervised in or around water. You do have a legal duty of care, just as at the beach. If Kiwitub is being used in the outdoors on the edge of a lake, or river, or the sea, etc., it doesn’t require a fence since the Act applies to ‘residential’ pools. Clearly, fencing around it would be “daft”, according to Water Safety NZ. You can’t fence the lake, for instance. This is the reason that jetties do not require fencing whereas balconies do. Even in a residential situation, Kiwitub is still a portable unit. Filled and emptied by a garden hose, it is not intrinsically part of the house plumbing or drainage, which removes it from various regulatory requirements. If it is built structurally into a deck, that is somewhat different. Otherwise, being empty until filled for use for a day or so and then emptied again, it is more similar to a deep paddling pool than to a spa pool in terms of risk. Kiwitub is NOT a spa pool or spa pool system. Spa and swimming pools are filled permanently with water, except for occasional cleaning. Kiwitub remains empty until filled for use, under supervision, for only a day or so. Hence it is statistically safer in any case. The Australian/New Zealand Standard AS/NZS 3136:2001, page 7, section 4.4, defines a ‘spa or swimming pool’ as ‘A water container which may be provided with electrical equipment for the purpose of heating, blowing, pumping, filtering, chlorination and chemical treatment, singly or in combination, and is not intended to be drained after each use.’ That is pretty comprehensively exactly what Kiwitub isn’t. Our system amounts to a burner running on firewood or LPG gas connected to a hot tub by a convection or ‘wet-back’ loop. It has no moving parts or chemicals and is incredibly robust and durable, hence can be used up mountains, on the beach, bounced across boulders, floated out to islands, dropped off a truck, as well as used at home. It is designed for outdoor use with manual controls under adult supervision. A New Zealand Standard (NZS 8500:2006 ‘Safety Barriers and Fences Around Swimming Pools, Spas and Hot Tubs’) was published about March 2007. It is to be the basis of the new Fencing of Swimming Pools Act to be passed this year (2007), replacing the old 1987 Act. 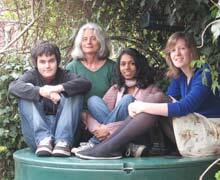 I found out about the Standard just before it was finalised, went to Wellington in September 2006 and saw Matt Claridge, the head of Water Safety New Zealand, and Ms Michelle Wessing, the project overseer for Standards New Zealand. I think it’s fair to say they were impressed that I had contacted Water Safety New Zealand for data and discussions on safety in the original design phase, and had then at our own initiative and expense come up with a product that was a quantum level above their minimum regulatory requirements in design and construction. Page 34 of the Standard (Section 3.10) applies to ‘Above-ground spas and hot tubs.’ It sets out minimum requirements, especially to do with the cover. 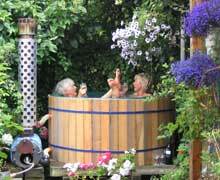 If the spa or hot tub complies, then it doesn’t require a fence. Our comment: Fair enough. They had to decide on some figure. The Kiwitub measures 730mm to the top lip of the tub (and 760mm with the lid on). We can’t simply add on an extra 30mm (1.2 inch) because it’s designed to just fit three deep in a container for exporting. However if you place the tub on 30mm thick tanalised timber planking or flagstones, then you have complied. A sympathetic building inspector or Council may decide that 30mm is really not significant anyway, especially given the rest of the design and construction. We deliberately didn’t use the plastic locking buckles usually used for spa pool covers because we think they’re fragile, fiddly, and won’t last. Our tub should last for many decades and our copper and cast brass burner for 100 years. This is not hype and we don’t want to use cheap breakable plastic catches with the lid, even if everyone else does. The ‘latching shut’ requirement we think is met by gravity and the inset design of our lid. The lid weighs 20.5 kg (45lbs)., is constructed of two skins of polyethylene plastic with polyurethane foam in between, making it rigid like a surfboard and tough enough to defeat an axe. 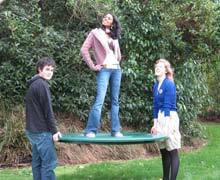 It is deliberately much heavier than a polystyrene spa pool cover and a young child could not lift it off the tub. It has a 50mm (2 in.) deep inset setting inside the rim of the tub - a bit like the lid of a Thermos flask. This means a young child could also not slide it off the tub. It is fully rigid so a young child could not wriggle in under it to the tub. It is also safer in human terms - once the lid is put onto our circular-rimmed tub in any orientation, that’s it: a child couldn’t get it off. 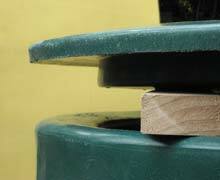 The four or more cover catches that spa pools use have to be clicked shut by hand, and this is less likely to be done. The reason for these latches is that without them a young child could lift off a light spa pool cover. It couldn’t do that with our lid. Our comment: We’ve had five adults on ours without it even bending. Our comment: We haven’t got a central hinge - this clause relates only to the usual spa pool cover. The reason for their taper is so that water won’t pool and collapse the cover because of its weight. Ours is massively too strong for that anyway. Clauses (c), (d), (f), (h), and (i): These relate to the efficacy and child-proofness of the locks and construction of the cover. 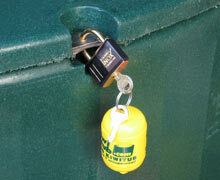 The marine padlocks we provide vastly more than meet these requirements. We provide them for security when storing gear in the empty tub, not just for child protection. They are high quality 40mm marine padlocks with a durability hugely greater than the usual plastic spa pool locking buckles. Our lid is likewise a quantum level better than the usual light polystyrene spa pool cover (see (2)). Our comment: I asked Matt Claridge, the head of Water Safety New Zealand (who were the main driving force for this Standard and the upcoming Act), specifically about this clause with reference to the Kiwitub burner which sits about 200mm out from the wall of the tub and is connected to it by two hoses. He said the clause related to movable objects and he wasn’t worried about the burner. Because of the low cylindrical shape of the burner and the flexibility of the hoses, it would be difficult for a small child to use it to climb onto the tub anyway; in any case the lid should be on. Our comment: The tub and lid are a darkish forest green, partly because a dark colour enables us to build in better UV protection, and partly because we thought it looked nice and blended into the environment better than bright colours. The warning and instruction lettering is bright yellow and molecularly bonded onto the lid. This is an expensive process which we chose because it gives the best durability, which means greater safety because the warning lettering lasts longer. If bright yellow lettering on a dark green background is not acceptable, then neither is every Department of Conservation sign in the country. So, does it require a fence or not? We don’t think it should, for all of the above perfectly sound reasons, except possibly for the height requirement which can be met by 30mm of packing. We set out at our own initiative and expense to produce a product which is genuinely safe and durable, not just wriggling in over some minimum compliance requirement. It is a bit galling to find that a bit of the wording aimed at much lighter and flimsy construction, also affects us. Building inspectors vary. Most are helpful and reasonable. We have already had approval from some, e.g. in Buller, for using the Kiwitub as is without a fence. We think any reasonable official considering these pages will agree with us that the Kiwitub massively over-complies with the intent of the new Standard (even if some specific wording is open to discussion) and therefore doesn’t require fencing, as of right. However note also that, by the terms of the 1987 and presumably also the coming 2007 Fencing of Swimming Pools Act, the local Council can grant a specific exemption anyway. We have had that happen also, e.g. in Wellington, even before the new more liberal Standard came out. If you do come across a compliance official who feels the Kiwitub requires a fence, in spite of reading these pages, you are entitled to take your case to your local Council. Its members are elected, and its decision supersedes that of one of its officials. These comments accurately describe the regulatory situation in New Zealand with Kiwitub to the best of my knowledge in August 2007. NZ free telephone to 0800Kiwitub (0800 549 488). Steve August, director of Kiwitub Ltd.